Abilympics: a silver medal for France in the Jewelery category! An international competition of the trades yes, but a competition especially dedicated to the promotion of the aptitudes of the disabled ! The name Abilympics is the result of a fusion of two essential words: abilities in English and the “Olympiques” approach. The concept of competitive industries was born in Japan in the 1970s on the model of the Paralympic Games . Today, the Abilympics International Federation, established in Hong Kong in 1991, aims to promote the Abilympics event internationally to organize a competition every four years. For this 9th edition , Cookson-CLAL was a business partner of the competition which took place for the first time in France , in Bordeaux, on 25 and 26 March 2016. A competition that has a taste of event for French competitors since for the first time this year, it is France that welcomes this much-anticipated event. Apart from France, 34 other countries are represented for 600 champions in competition . Open to the general public, this competition will have welcomed almost 6000 visitors over 2 days for a total of 49 events in the most varied fields: mechanics, computer science, cooking, photography, industrial design and of course: jewelery ! This Abilympics competition for people with disabilities has several ambitions: beyond the performance aspect, it wants to enhance the skills of these professionals with disabilities in order to promote their integration. It should be noted that this competition takes place at the same time and in the same place as the regional finals of the Skills Olympiads , their equivalent for “valid” ones. Among the medalists of this competition is a Bordeaux almost accustomed . 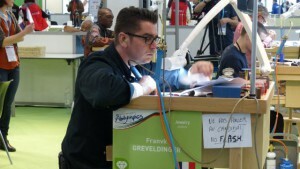 For his second participation, Frank Greveldinger , 45, won the silver medal in the Jewelery category , just behind the Korean candidate and before the Chinese candidates. After 6 hours of work spread over the two days of competition , the candidates had to make a piece from a simple photo and a technical sheet. In Seoul in 2011, Frank finished 4th. He hoped for the podium this year, it’s done! To get to the full of his skills this year, Frank has prepared for the test in addition to his professional activity. He was able to keep his trade as a jeweler even after a ski accident made him paraplegic. Joaillier to his account for 10 years, he now owns a jewelry store in the city center of Bordeaux that he opened with a partner.